The W530 is a solid performer which is more than capable of hosting basic CAD/CAM applications, and it represents good value for money. Desktop workstations can be both big and expensive, but not so the Fujitsu Celsius W530, a compact and affordable entry-level workstation designed to bridge the gap between high-end PCs and much more expensive professional models. Okay, so it's only got one processor, but that's reflected in the £1,430 recommended price (around $2,160, AU$2,680), and we found it selling for a lot less than that online. Moreover, with a more than capable Nvidia Quadro graphics card as standard, the Celsius comes equipped to handle not just CAD/CAM but advanced video editing, basic animation work and a lot more besides. About the same size as the average desk-side PC (6.9 x 16.5 x 15.6-inches, or 175 x 419 x 395mm), the Celsius chassis doesn't quite match the build quality of Dell's Precision range, but is nonetheless nicely laid out and well put together. Access is good, as well, with a fully removable side panel and lots of room inside, not least because of the diminutive Micro-ATX motherboard, which takes up hardly any space at all. Power comes from a standard 300 Watt supply with cooling handled by the fan in the PSU plus another fan mounted low down at the front of the casing. Most of the airflow from this goes across the motherboard, but there's also a metal baffle to direct some of it down to the storage bays in the bottom of the chassis. The graphics card also has a fan but, despite a tally of three altogether, the Celsius proved remarkably quiet even when pushed hard. Fujitsu calls it "whisper quiet" and, at around 16dB, we tend to agree. There's just the one processor socket on the motherboard able to accommodate either an Intel Core i7 or Xeon E3-1200 v3 processor. 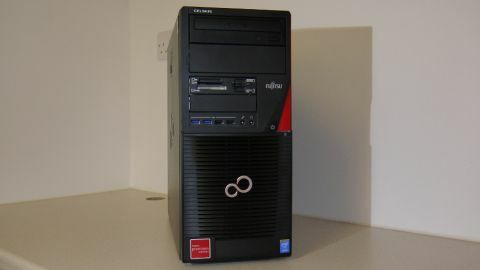 Fujitsu can equip the W530 with either, the review system shipping with a 3.6GHz Xeon E3-1271 v3 which is based on the latest Haswell architecture, offering up four processing cores or eight threads using Intel's Hyper-Threading technology. With an 80 Watt TDP the E3-1271 v3 is a good fit in this entry-level workstation, enabling it to a score a very respectable 14,412 using the latest GeekBench 3 benchmark. Of course, you also need memory and to support the Xeon processor up to 32GB can be fitted in four DIMM slots, ours coming with a decent enough 8GB on just two sticks. That RAM, however, is 1600MHz DDR3, as support for the faster and more energy-efficient DDR4 memory is only available on systems equipped with the latest Xeon E5 v3 processors. Still, for the kind of applications this workstation is aimed at that shouldn't be too much of an issue, and it certainly didn't seem to have much of an impact in our tests. In terms of storage you can fit two 3.5-inch and a single 2.5-inch drive in the base of the chassis, the review system shipping with a 2.5-inch 128GB Toshiba SSD as a boot disk plus a 1TB Seagate hard disk for data storage. A good setup to begin with, there's room for another disk in the external drive bays at the top of the case and six SATA ports altogether to handle this plus the DVD writer and multi SD Card reader provided. Networking comes via an on-board Gigabit Ethernet interface and there are 13 USB ports with four at the front (two are USB 3.0), six at the back (again, two are USB 3.0) and three inside. Order the W530 with a Core i7 processor and it will use the on-board Intel controller to manage the graphics output. With the Xeon E3-1271 v3 fitted inside ours, however, a plug-in card is required, the review system sporting a shiny Nvidia Quadro K2200 able to send graphics output to three high resolution monitors through a pair of on-board Displayport sockets plus a single DVI-I connector. Equipped with 4GB of video memory and 640 CUDA processing cores, the K2200 is fairly low down in the Quadro hierarchy but is, nonetheless, a good choice for the kind of applications this workstation is likely to be used for. Moreover, it enabled the W530 to post some pretty good scores when tested using the Maxon Cinebench R15 benchmark. Particularly in the OpenGL test which mostly stresses the graphics card, where it managed a creditable 122.01 fps. The W530 isn't quite as quick as the Dell Precision Tower 5810, but it's surprisingly good for this very affordable single-socket workstation.